The following is Extract from "Soldier Blue" My service life in the Royal Air Force Regiment. 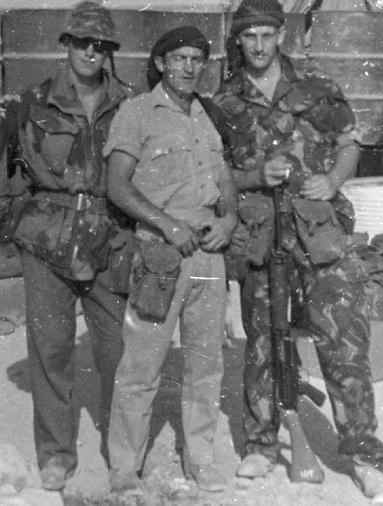 It's May 1967 and I'm 18 years old and serving in 16 Squadron, RAF Regiment, patrolling around Aden from RAF Khormaksar. The Flight Commander asked for volunteers to go on detachment 'up country' and seeing as there were over a hundred incidents a day in Aden (both factions of local antagonists were currently in the active process of reclaiming their bit of the British Empire back) I thought it would be a nice experience. After all, I'd joined the RAF Regiment to travel and I thought it might be a bit quieter up country. British Camp Mukerius was sited 7,000 feet up in the Jebel (mountains) on the border between Aden and North Yemen, and its purpose was to house a radar unit belonging to 303 Sigs. Unit. This radar kept watch over the border, and our job was to protect it. We lived in tents, whose walls were lined with sandbags to protect us from the mortar bombs that arrived on a regular basis, courtesy of the guerrillas assisting the struggle going on in Aden. I could tell at a glance that this place was not going to be quiet. The water for the camp came from an ancient well in the nearby village of Mukerius and it was just drinkable. To get the water, once a week the airstrip fire wagon, escorted by some of us Regiment lads in a Land Rover, would leave camp and drive to the well, where a fireman would drop a hose down the deep, dark, crumbling hole in the ground and water would be pumped into the tank on the fire tender. We all noticed, as weeks passed, that the water became more and more horrible to the taste. Then, whilst doing a weekly filling something blocked the hose and the precious water ceased to flow, so, a fireman was lowered down the 60 feet deep 1,000-year-old well to see what was blocking the hose. He spotted it straight away but in the dark it took him some time to work out what it was; it was a dead Arab.